The UN, the EU and the US, the Arab and Western Countries are all to blame in the Middle East Conflict. Some time ago Rachel was having a real bad time. He had been abused as a child, set to sell her body as a prostitute, she was beaten every second day. Her life was hell but she was strong and survived. When the police cleared the place where she was forced to work, she was invited to live in a social flat in a beautiful but marginal area of the city, with some of the other girls. They were given subsidies to live better, help to get new positions and all looked fine. The city hall was very moved by their story and they really wanted to help them. Rachel and her friends soon realized that the block where they lived there were many dealers and gangs, messy and dangerous. The city hall knew this, so they got protection too. After a couple of months, one of the guys in the block complained to the social worker that the new girls were using the roof and other common zones they shouldn’t be allowed to, but the social worker didn’t pay much attention to him. Rachel and her friends had started to live properly, they were working, they had boyfriends… and needed more intimacy! So they started using some of the empty flats that weren’t being used in the block. This made their neighbors angry, because they used them sometimes for their dealing. The city hall sent the girls a letter telling them that they shouldn’t use any apartments further to the official ones, but didn’t take much care of it because in the end, it was better to have the girls. One night, while Rachel was in one of the flats with John, her boyfriend, a dealer appeared and guns came out. The dealer died, Rachel took his money and her boyfriend testified how the dealer had tried to kill them, so they were declared innocent. The hate for these girls was growing in the block, since they started making their neighbors’ lives impossible, forcing them to ask for a flat change in the social network, and taking their flats for new friends of theirs. The girls’ gang set their rules, and the city hall remained impassible because, poor them, they had suffered a lot when they were little, and they still were preferable to the scum living in the block before them. With the mayor’s silent consent, they managed to get most of the block for their gang with the exception of five flats that resisted them. The dealers took any chance to try to regain their block, but the girls had grown so powerful by then that even the smallest offense against them could get heavily punished. In case it hasn’t been obvious for any of you, this is more or less what we have done in Palestine and Israel: we -the UN, Europe, the US- decided that the Jews deserved a better life after all their suffering in Nazi times, and offered them a place to live in peace and bounty. That was really kind of us. So we decided to give them not a part of our lands, no, we weren’t THAT lavish. We decided to give them the land they had always longed for: Israel. Well, that’s cool too, right? Well, but we decided this WITHOUT HAVING THE CONSENT of the people living there. We set the borders, we had the UK army there for a while and we left them there to their fate, proud of our doing. Obviously this wasn’t totally magnanimous. Nobody is that silly! We had an interest there: having an ally in the middle of the dangerous, unpredictable and (since the oil was discovered) rich Arab countries, it was easier for us to keep the zone under control. Creating absurd threats and wars, we could have Israel spend much more money in weapons, coming from where??? Western countries like the US, Spain or Germany. And we could even have as many army bases as we could need if, let’s say, a country with loads of resources was found to have an abominable dictator in the area. So ok, blame Hamas for resisting the occupation of the legitimate Palestine lands with rockets. 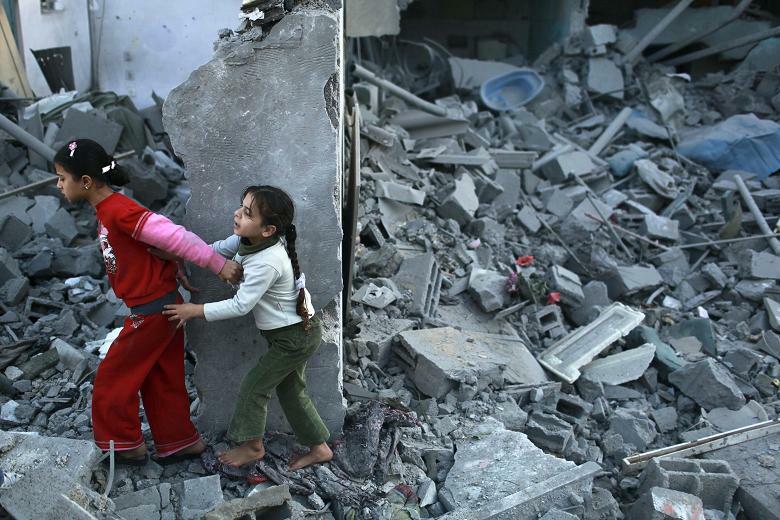 Blame the Israeli government for the killing of thousands -and not only in Gaza. But don’t blame them because they haven’t reached peace yet, because that is just impossible. Blame our own governments and the UN for not having taken care of the situation from the beginning, for over 60 years now. Blame the Arab countries for playing to friends-enemies with Israel depending on their own interests. Blame the UN for writing resolutions to keep forms but not forcing Israel to comply with them; for allowing silently the settlements, the wall, the genocide of the Palestine people. Those four kids dying on the beach while playing, that’s our doing. And we’re far too busy looking at our own belly button to bother about what is happening there. Karma, karma, karma. If you, personally you, don’t mind about what is happening in Gaza, don’t expect anyone to be moved if anything happens to you. Karma, karma, karma.